Sofia-Chezene Theophilou saw some children on the beach taking photographs and films and was inspired to create an awards event to showcase their abilities. We are a non-profit organisation and currently looking to become a registered charity. SFPF AWARDS is delighted that representatives from Blackpool, Fylde and Wyre are attending the awards event. There are 14 categories covering film, TV presenting, writing, photography and acting. The competition splits between three age categories, 7 – 10, 11 – 14, 15 – 18 years old. The nominees will receive an award. The other entries who enter the competition and don’t win, we will still be invited to attend the event and get a certificate of engagement. 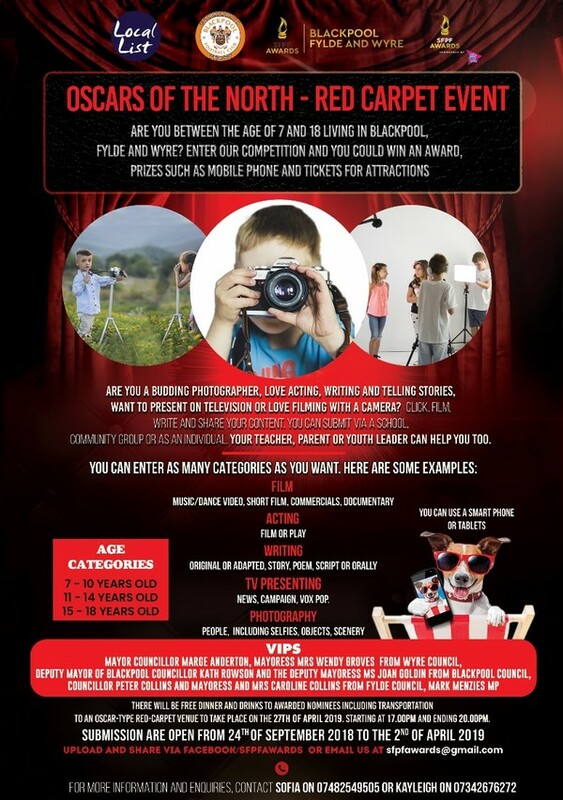 With a creative team, who assist with the workshops which were set up to give children and young people aged 7 – 18 years old new skills in filming, TV presenting, writing, acting and photography. The judges are from a representative of the community and the entertainment industry for the UK and overseas. Director Stefano Pratesi, from Italy, will also be on the judging panel. WHY AN AWARDS CEREMONY? Venue address: Hotel and Apartments Social Club, 122 Coronation St, Blackpool FY1 4QQ 5 pm - 8 pm on 27th April 2019. Blackpool is known as a disadvantaged area, but there are so many children and young people with talents that are never seen by the general public. The opportunities also for children and young people in Blackpool and surrounding areas to showcase their talents to the UK and the international community is non-existent. 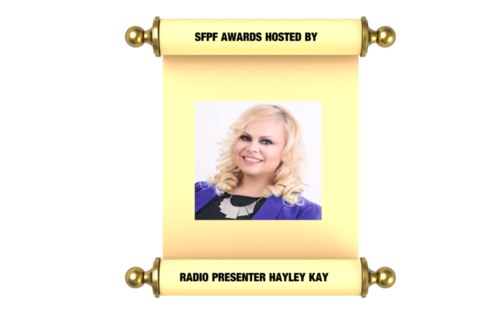 SFPF Awards is an online festival competition with an evening Awards event. This awards event is the first of its kind which is inspired by The Oscar and on the 27th April 2019. The event will be a red-carpet event where the children and young people dress up to attend with their parents, teachers, youth officers. For this reason, we want to provide a free entry event, being the first of its kind . We planned in future to expand out to other areas around the UK and overseas in the next few years. The competition is open to schools, colleges, youth groups, voluntary organisations, home-educators and youth clubs. We have reached out to parents, schools, youth clubs and youth organisations and are receiving submissions, via our email address. The videos are on our Vimeo account which is locked to private for the judges and our photographs and writing submissions are in a folder. We are keeping the excitement of who wins until the night of the event. After the Awards event, all the photographs and videos will be seen on our website. We have had local media support in getting the word out and received £1,500 to cover expenses of the workshops which include some venue costs, marketing and posters and travel expenses for the workshops. Venue costs are sponsored, and we have had in-kind advice and support from Blackpool Community Trust. We are still seeking more help to ensure the event is a magical experience for children and young people. Our Media Sponsors are: Local List, Let's Go Magazine, Fylde Coast Radio and Blackpool Gazette. WHAT DO WE NEED FUNDING FOR? -We need a total of £2500.00 to cover all outstanding costs. -We want to provide food and drink free for children and young people and although we have some budget to cover it, we still need more. -We need external venue costs such as red carpet, filming production, photographers, large backdrop banners. -Admin fees are required to cover professional costs, travel costs for judges, volunteers and runners. You can donate through our Fundsurfer campaign. We are transparent so will ensure all the donors can see an audit of where all the funds raised went. We understand as a donor that you may think this is a significant risk for us to do but when you see the faces of the children and young people that take part and submitting their contents and to see the joy that they have done something they thought no one thought they could do it is impressive. We have seen children and young people who have autism, engaged in the workshops who have never involved in anything before. They got talking to each other and ran with the camera assignment producing fantastic content within a short time. However, with your support, we would love to run this event and with you being a pioneer and once you have donated, we will thank you forever! Please pledge if you can and share our Blackpool, Fylde and Wyre project with your friends and family, businesses and organisations, it would really help. We will thank you forever. We are looking for Schools, Youth clubs/groups, performing art groups, home-educated children/young people and individuals can take part and submit through their organisations, please share to spread the word! £1 – The big thank you! £1-£10 donation include a personal thank you and mention on social media and certificate of funds donated. £10 -50 includes the above plus name in a brochure. £50 - £100 includes the above plus 1 x VIP attending. £100 plus includes the above plus name on the trophy and handing out the award to the winner. Feature your company or business at the awards show and get involved with a local Blackpool project supporting young people to get involved with art, film, music and much more! We are currently rowing the Atlantic to raise funds for Movember and we need your help to get our boat shipped home after we finish.